WATERLOO, IOWA - Delores "Toodie" Jane Arhart, 77, of Mason City, Iowa, and formerly of Waterloo, died Thursday, December 29, 2011, at Good Shephard in Mason City. She was born March 21, 1934, in Bristow, Iowa. Survived by her husband, Robert Arhart of Garner; two sons, Randy (Jane) of Austin, Minnesota, and Rick (Tammy); and two daughters, Janine (Brian) Hammarstedt of Mason city and Kim (Kevin) Smith of Belmond. Services: 11 a.m. Wednesday at Wesley United Methodist Church, Mason City. Public visitation from 4 to 8 p.m. Tuesday at the church. Andrews Funeral Homes, Belmond, is assisting the family. Memorials may be directed to the church in her name or to Robert Arhart, 625 Golf View Drive, Garner, IA 50438, in care of the family. 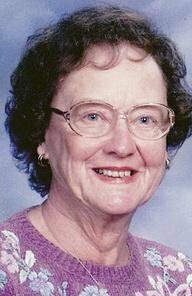 Delores “Toodie” Jane Arhart, 77, died Thursday, Dec. 29, 2011, at the Good Shepherd in Mason City. Funeral services will be 11 a.m. Wednesday, Jan. 4, at the Wesley United Methodist Church in Mason City at 1405 S. Pennsylvania Ave. Mason City, Iowa, 50401. Pastor Keith Scott will officiate. A luncheon will follow the service at the church. The interment will be at the West Side Cemetery in Marble Rock, Iowa, following the luncheon. A visitation will be 4 to 8 p.m. Tuesday, Jan. 3, at the Wesley United Methodist Church in Mason City. Visitation will also be one hour before the service on Wednesday. Memorials can be made to Wesley United Methodist Church in Delores’s name or may be directed to the family by sending to Robert Arhart 625 Golf View Dr. Garner, Iowa, 50438. The family will distribute the memorial funds to charities that benefited Delores. Delores “Toodie” Arhart was born in Bristow, Iowa, on March 21, 1934, to Henry and Velma (Bohnoff) Krull. She was one of six children: Edward, Marjorie, Harry, Lyle and Sam. She spent the first years of her education going to country schools and later attended and graduated from Marble Rock High School. In 1956 Delores married the love of her life, Robert Arhart, and this union was blessed with four children: Randy, Janine, Kim, and Rick. Among caring for her family as a full-time homemaker, she spent time cooking, working at various places, including Younker’s, Penney’s and Cub Foods. She also worked many years at the Tom Thumb Deli in the Twin Cities. There she acquired the nickname of Julia Child for her delectable dishes. She was promoted to their main downtown store until the couple returned to Garner, where she resided for her retirement. Delores had a passion for gardening. She had many plants and flowers with all kinds of foliage. She truly had a green thumb. She enjoyed decorating their retirement home, along with collecting handcrafted birds, china tea sets and porcelain dolls. Delores was extremely shy in her younger years; but as the years went by, she blossomed, just like her many gardens, into a social, loving person, who foremost loved her husband Robert, children, grandchildren and great-grandchildren, among countless friends. Delores loved to be around her family and couldn’t wait to host their next gathering. Delores’ love and memories will live on in the hearts of her husband, Robert Arhart of Garner, Iowa; son, Randy (Jane) Arhart of Austin and their children, Ryan (Kelsey), Lindsay and Ashley; daughter, Janine (Brian) Hammarstedt of Mason City and their children, Michele (Dan) Werts and their baby due in February 2012, Matt Hammarstedt and Amanda (Nick) Steege and their children, Noah and Tayden; daughter, Kim (Kevin) Smith of Belmond, Iowa, and their sons, Kody and Kyle; son, Rick (Tammy) Arhart of Rochester, Minn., and their daughters Abigail and Alexandria; brother, Lyle Krull and sister, Sam (Earl) Usher; other beloved relatives. Delores is preceded in death by her parents, Henry and Velma Krull; brothers, Edward and Harry and sister Marjorie. Andrews Funeral Homes, Belmond, Iowa, (641) 444-4474. Photo of Delores Arhart from Austin Daily Herald website.